One marketing tool used by restaurateurs to attract more customers is creating a separate menu for different meal offerings. For instance, a local casual dining restaurant may start offering brunch meals and create a specially crafted brunch menu design. When done right, this can become a sustainable marketing strategy for most dining establishments since customers will associate their food with a specific mealtime. If you are looking to develop your own restaurant’s lunch menu, you have come to the right place. 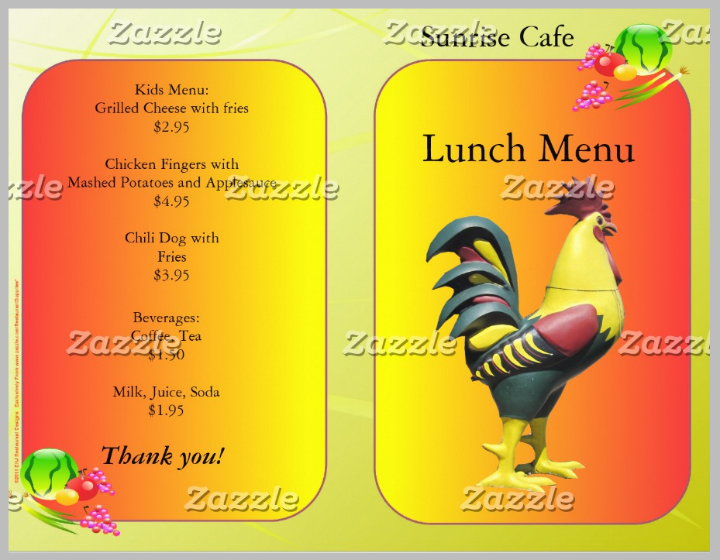 In this article, we provide 15 sample lunch menu card designs that you could easily customize. Plus, additional tips on how to create lunch menu designs that stand out are included in this list. If you are still on the fence whether you should create a separate lunch menu or not, listed below are five more reasons that may help convince you into proceeding with this strategy. To attract new diners. 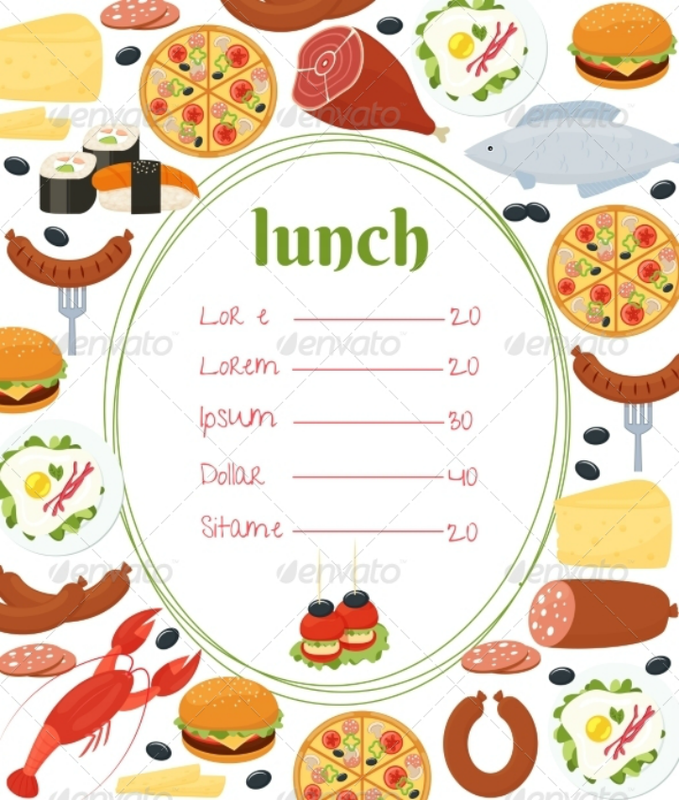 As mentioned at the beginning of this article, creating a new lunch menu design for your restaurant helps in attracting new customers. Diners are often lured by anything new. When they find out that a restaurant has re-designed their lunch menu, they will be lured into trying it out. And if they like what they eat, they will surely return for more. For this strategy to work, note that there are other elements in running your restaurant that may also have to change so that everything will work seamlessly. To provide new meal offerings to customers. Just changing your restaurant menu design into a lunch menu upfront without making any changes to the kinds of food that you are offering is detrimental to your restaurant’s success. This may work for some food establishments. But if you want long-lasting positive effects and a loyal customer base in return, making sure that your dining establishment also offers new lunch food selections is essential. Treat your customers as discerning individuals who know that a restaurant is genuinely offering good service or not. To reinvent your restaurant image and/or vision. Another reason why you may need to create a separate lunch menu is if you want to completely reinvent your restaurant’s image and vision as a business. For instance, if you are currently operating a cafe offering sandwiches and coffee but want to expand your services into the more lucrative casual dining niche, creating a separate lunch menu is one of the ways to transition into this new field. 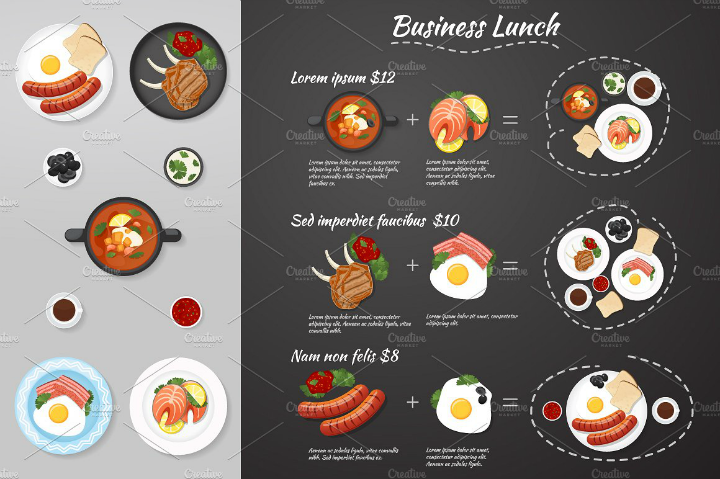 This way, you may have to create small restaurant menu templates that include a separate lunch menu design. To separate different meal offerings that are available only at a specific time of the day. For restaurants that offer a lot of meal and food choices, customers may feel overwhelmed every time they order something. This may also mean additional work for restaurant wait staff who may have to explain the different meal offerings to customers. To remedy this, simplifying your sample restaurant menu by creating separate mealtime menu designs may be the way to go. Breakfast, lunch, and dinner time meals will all have their own separate menu designs. This strategy may also apply to fast food and fast casual dining restaurants since they can create separate overhead menu designs that they swap out during certain times of the day. Note that as a business owner, it is at your discretion if you allow customers to order food that is not part of the current mealtime menu being served. To determine what works for your restaurant. Restaurants are businesses. Sometimes they work and the restaurant owner earns profits. But at other times, restaurants struggle to earn profits. As a restaurant owner, you should be savvy enough to know what your target market wants in their food. One way to do this is by testing out different menu selections, retaining the food items that customers keep coming back to, and replacing the ones that do not get ordered as much. Using a separate lunch menu design is an A/B testing tool for the foodservice industry as long as you keep changing out the menu items until you get one that truly clicks with your customer base. If you are creating a separate lunch menu for your restaurant, make sure that this new menu still follows the theme used in your other menu designs. 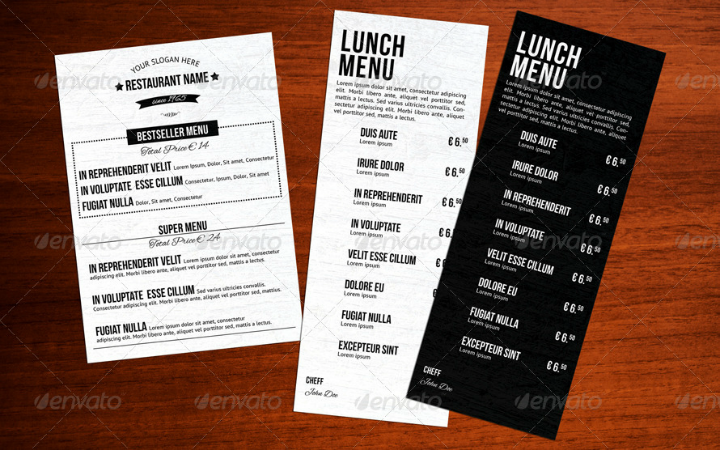 A lunch menu design should complement your restaurant’s main menu template. To illustrate, if your restaurant uses a rustic menu template, you should use this same rustic theme in designing the lunch menu card. Doing this will help strengthen your restaurant’s branding power. 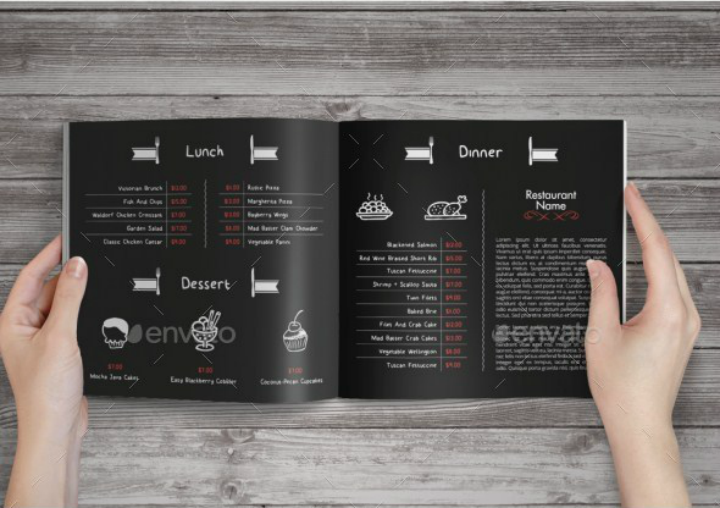 Include company branding on the menu design. Another way to increase brand recognizability is to incorporate your business logo design into the lunch card menu itself. But if your company logo looks too businesslike and does not fit the quirky image your brand is trying to achieve, you may create a toned down version of your logo. In some cases, you may use creative logo designs instead. Layout most lunch meal offerings into one back to back menu page. One reason for creating a separate lunch menu is to simplify the ordering process. Customers who are eating out for lunch often have only an hour or two to eat lunch so ordering food should take less time. By using a single page lunch menu card, customers will not have to flip through different menu card pages. When customers are able to order right away, the restaurant staff will be able to prepare and serve the food quicker. Include images, food descriptions, and prices as much as possible. One restaurant hack that encourages customers to order is by including descriptions, pictures, and corresponding prices of the different meals in the menu card design. When crafting your own lunch menu, learn as much menu description writing tips as possible and apply them to each menu template that you could come up with. When customers see photos of the items they are ordering, they will be more inclined to try it out. Seeing the price of a meal without the currency signs ($ or €) has a psychological effect that somehow tells customers that they are not spending that much for a particular meal. Use card design templates. 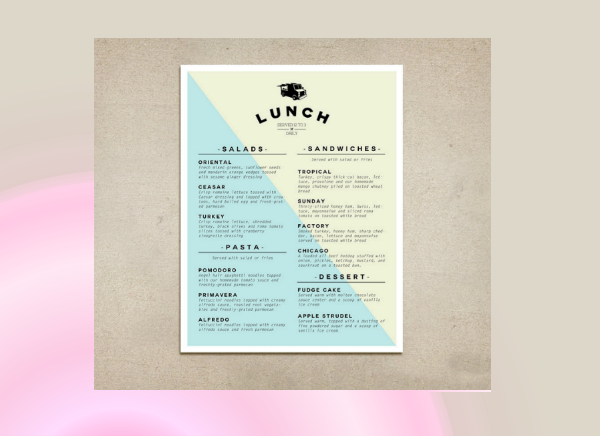 Menu card designs in PSD, InDesign, AI, or JPEG file formats are available to be used as a template for your own lunch menu design. When you use a pre-made design template, the guesswork needed in creating a menu design from scratch has already been addressed. All you have to do on your end is to make little modifications like inputting the specific meal items, prices, and pictures into different placeholders on the template file. You do not have to think about template layouts, color schemes, typefaces, etc. because all these design elements have already been created before you purchased the template. 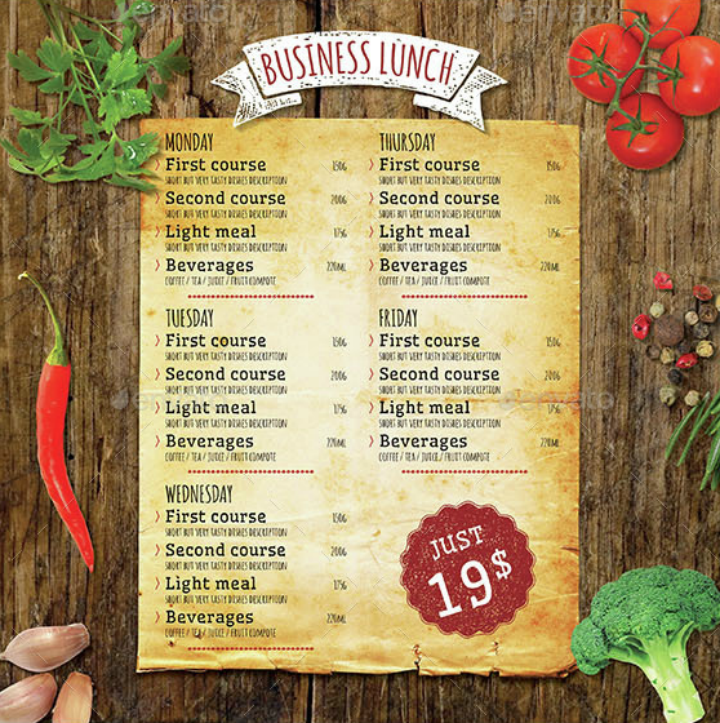 Save a copy of this menu design template for future use. 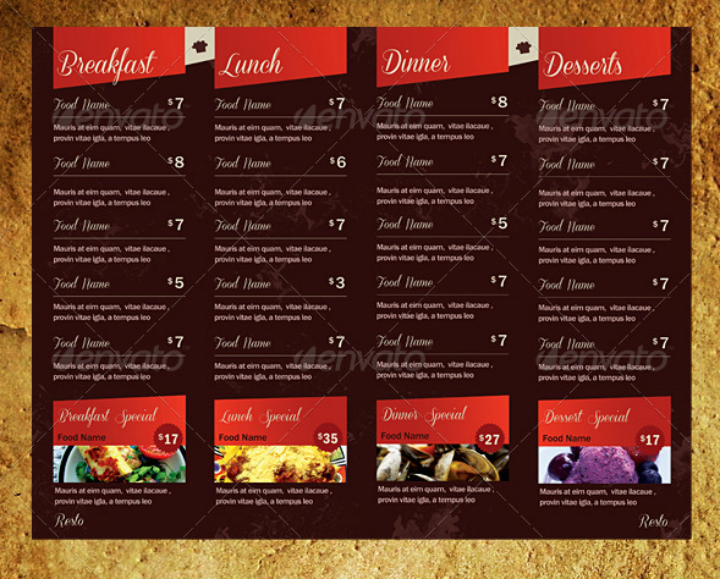 After creating and/or editing the lunch menu design template, make sure to always save a copy of the template. Most card design templates are stored in PSD or INDD (InDesign) file format depending on the software program that was used to create them. By saving a copy of the menu template in this format, you will be able to edit the entire file in the future. This way, if you want to update the meal offerings in your menu card, you do not need to create a new lunch menu design. Have someone proofread the menu template before printing. Once your lunch menu design is printed out, it becomes a public document. Countless customers will peruse it every day before they make an order. Any typo, grammatical error, or unedited picture will always haunt you as the graphic designer or restaurateur who created it. Customers may even be turned off when they see this mistake as it can indicate you are not a professional. To prevent incidents like this, always make sure to have another person proofread the entire document before printing it. A new set of eyes can spot mistakes and discrepancies that a creator has become blind to spot. Proofreading also allows you to catch errors on formatting like the incorrect placement of photos and in correcting the bleed line of the printable menu template. Print on high-quality paper. After making sure that there are no errors in the lunch menu template, it is time to print them out. Depending on the type of lunch menu design that you have created, you may need a different thickness of the paper that you use. 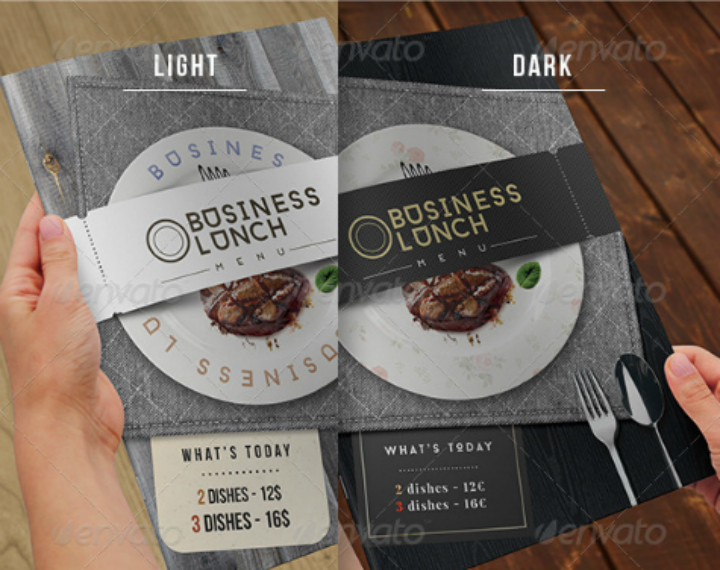 For example, if you are creating a lunch menu design for a fine dining restaurant, you may need to print the menu card into a high-quality thick card stock. And if you are creating a lunch menu for a pizza parlor, you may need a moderately thick premium paper for your pizza menu templates. Always make sure to use the best quality of paper for your menu cards so that you do not have to frequently replace the menu cards. Convert some printed menus into flyers that you can give away to potential customers. An additional tip when creating lunch menu cards is to convert some of these menu cards into lunch menu flyer designs to be given away to prospective customers. Lunch menu flyers are often printed in bulk and on regular paper. This serves as an efficient way to creating promotional material for your restaurant.